Any combination of colours available. Prices for other colours: +12% for plain +22% for woodgrain and patterns. 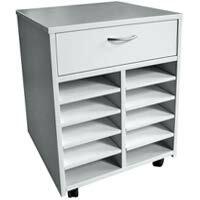 The MP4 mobile pedestal features a utility drawer with 10 stationery trays below. The stationery trays can hold A4 paper. For other colour options refer to Formica and Laminex Commercial Ranges below. There are a variety of ways to buy any of Shawtec's products. Government Agencies may order directly.